Saor is actually the new name of one-man project Àrsaidh, rebranded last year after discovering that nobody could search for the band name with that accented "a" (and, one suspects, also getting tired of everyone pronouncing the name as "arse-head"). 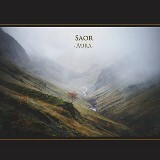 Aura, their first album as Saor, consists of gentle and melancholy black metal with a nature-themed atmosphere and Celtic folk trappings that would sound quite at home in the band's native Scotland. The tracks are luxurious, with few under ten minutes long, and the flutes start up in the first minute or so of the album to lend it a folk flavor. Andy Marshall, the man behind Saor, keeps his vocals pretty quiet and blends them with the rhythm guitar so much that they're easy to ignore. While there is some lead guitar, all in all the instruments normally used for metal -- guitar, drums, bass, and such -- are in the background, and more traditional instruments such as the piano and flute get most of the time with the audience. While Children of the Mist tries a little too hard to be a marching song, the title track is a better and more melodic piece, with a fairly catchy hook and a lonely, echoing sound that is equally accommodating of both its fast passages and slower, reflective ones -- and there are a fair number of the latter on this track. Despite the album having plenty of black metal hallmarks, this definitely feels more on the folk side of things than the black metal world. After all, it's hard to regard it as a bleak or tormented album. Aura is more like a soundtrack to a heroic movie -- perhaps Braveheart, or something similar. There are vocal choirs that sound almost upbeat and sighing female background vocals, acoustic solos and flute ditties, and a few nods to earlier metal acts when Marshall gets in the mood to come back from his indulgence in the epic folk song (we even get some NWOBHM-style galloping for a while on The Awakening). It would, however, be better if all that attention to a wide-ranging sound came along with some memorable hooks. Most of the songs have the drawbacks of a soundtrack as well as the benefits, and while they sound nice, nothing in them is going to stick very well in the listener's head, although the doomy riffs of the slow parts of Pillars of the Earth do come very close. Aura is a nicely produced, if somewhat forgettable, album; pretty good as a source for background music, when the listener doesn't need to be distracted. I wouldn't recommend this as a steady diet, but I certainly enjoyed listening to it.